3) the urban space as a work of archi­tec­ture and its cultural, histor­ical and artistic value (Chair for Urban Heritage). Attri­bu­tions of value, spatial devel­op­ment and plan state­ments were combined in the term “Hobrechtian Berlin” in order to do justice to the multi­di­men­sion­ality of the object of inves­ti­ga­tion. 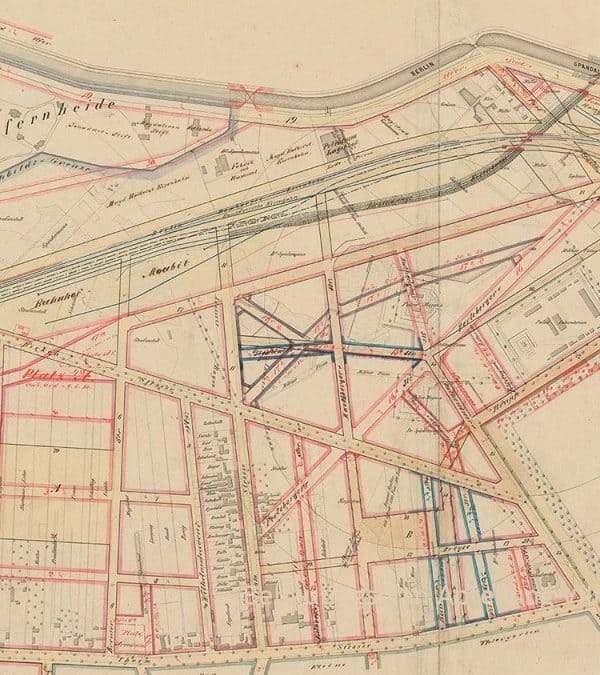 At the same time, this complexity was reflected in the combi­na­tion of urban-morpho­log­ical analyzes with inves­ti­ga­tions into mission state­ments, social values, and compa­rable 19th-century Euro­pean urban plan­ning. Thus, local insights into the urban struc­ture of Berlin were set into the Euro­pean context of the time, histor­ical and method­olog­ical knowl­edge gained and Hobrecht’s contri­bu­tion to urban plan­ning reeval­u­ated. In addi­tion, the plan was exam­ined as a control and regu­la­tion instru­ment under changed condi­tions of the 19th Century. The revis­iting of the under­lying design deci­sions deep­ened the under­standing of the devel­op­ment of urban plan­ning disci­pline in a signif­i­cant way: By looking at the built city to this day, it is possible to view the history of ideas and real history over a long period of time. In addi­tion, a contri­bu­tion was made to current debates about the Euro­pean city and its common heritage, and crit­ical reflec­tion was encour­aged. K LAB (or the Kartogra­phie­ver­bund as prede­cessor insti­tu­tion) was involved in carto­graphic work on the research project. It was based on the Berlin geodata inven­to­ries of the map collec­tion, infor­ma­tion levels of the city — espe­cially histor­ical maps — digi­tized and inte­grated the data in a geographic infor­ma­tion system. Based on this fund of advice, concep­tion and imple­men­ta­tion of the carto­graphic compo­nents of the research project to data output (analog and digital). The maps and visu­al­iza­tions were included in various publi­ca­tions. Dolff-Bonekämper, Gabi / Million, Angela / Pahl-Weber, Elke (Eds.) (2018): Das Hobrechtsche Berlin. Wach­stum, Wandel und Wert der Berliner Stadter­weiterung. DOM publishers, Berlin. Calbet i Elias, Laura / Hutterer, Florian / Uttke; Angela (2013): 150 Jahre Hobrecht­plan. Die wiederkehrende Frage nach dem großen Plan. In: AK Städtebau SRL „Der Große Plan. Aktuelle Beiträge zum Städtebau.“ Berlin. S. 123–126. ISSN 0936–0778. Bentlin, Felix (2012): Raum­schule Neukölln – Architek­turver­mit­tlung durch Mapping im Hobrecht’schen Berlin. In: PLANERIN 5/2012: Pixel, Bits & Netzw­erke, S. 43–44. Rhede, Chris­tiane / Hutterer, Florian / Herold, Stephanie / Calbet i Elias, Laura (2011): Bebau­ungs- oder Frei­flächen­plan? Die Rolle des öffentlichen Raumes bei Hobrecht. In: Flecken / Calbet i Elias (Hrsg. ): Der öffentliche Raum? Sichten, Reflex­ionen, Beispiele. Berlin 2011, S. 95–106.